Jason is on the move again! On the 6th of Jan 2013 at 5.30am Jason left home for OR Tambo Airport south Africa to embark on another climbing expedition. Jason flew to Buenos Aires and caught a connecting flight to Mendoza. 7th of Jan at +- 3.15 am South African time Jason landed in Mendoza and spent the day in Mendoza making last moment checks on Equipment in Preparation for Climb. 8th of Jan at around 2.30pm South African time Jason left Mendoza for Puente Del Inca a five hour drive by vehicle. Jason arrived at Puente Del Inca at around 20.45pm South African time. Peunte del Inca is situated at 2715 meters. The name Puente del Inca comes from the impressive natural sulphur bridge that crosses the Horcones river. Naturally heatedmineral water pours into man made pools. 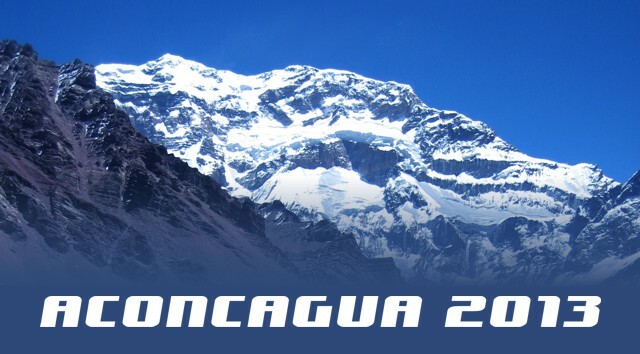 Tomorrow the 9th of Jan at about 9.15am which will be Jason’s local time, Jason is expected to start the Climb. Mendoza is +- 5 hours behind South African time. 9th of Jan 2013, At about 9.00am Mendoza (13.58pm South African Time) received Text Message from Jason to say that they were heading into the Park. The trail follows the Horcones River for 8 kilometers to the junction of the Lower and the Upper Horcones River. 12th of Jan 2013, I had brief contact with Jason by way of Sat Phone today, Jason has reached base camp Plaza de Mulas, this was our first contact with Jason since the 9th of Jan. The Height of Base Camp is 4230 meters and today was a rest day. 14th Jan 2012, I spoke to Jason briefly today, he says that they did a load carry yesterday up to the next camp Nido de Condores or the Condor's Nest (camp 1 at 5370 meters). From the camp at Plaza de Mules, a well worn trail climbs and slowly gains elevation by switch-backing up steep scree slopes, past Camp Canada (4880 meters) and Camp Alaska (5220 meters). Then returned back to base camp, where today was spent as a rest day. It is expected that tomorrow the 15th Jan 2011 they will return to 5370 meters. 17th of Jan 2012, had word that Jason was at 5500 meters and is expected to go to +-6000 meters Nido de Condores. 18th Jan 2013 I Spoke to Jason very briefly today he is at 5500 meters and will go to 6000 meters tomorrow. 20th Jan 2013 at 19hrs.02min South African time ( +- 14.00hrs on the Summit of Aconcagua) I received a call from Jason by way of Sat phone, he is on the summit, highest peak in the Southern Hemisphere. Will make contact again after decent and reaching camp. 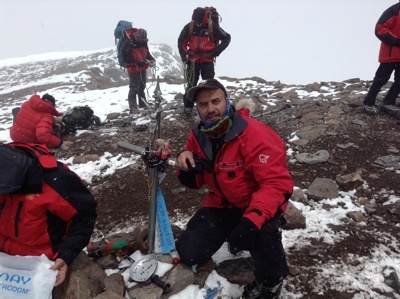 20th Jan 2013 round about midnight South African time (+- 19.00hrs Aconcagua) Jason reported that they had descended to 6000 meters and were back at camp. 21st Jan 2013 at 13hrs 30 min (8hrs 30min am Aconcagua) Jason let advised that they were all well and would be descending again today. 22nd Jan spoke to Jason, Jason was back at Puente del Inca he and all team members are well. The whole team summited. 22nd Jan 2013 the team left Puente del Inca for Mendoza but had to return to Puente del Inca due to flash flood having washed the road away. 23rd Jan 2013 Jason advised that they are about to leave for Mendoza. 26th Jan 2013 Jason landed at O R Tambo Airport. Congratulations and welcome home Jason! As the world mourns the passing of Muhammad Ali, the undeniable 'Greatest', we celebrate the iconic boxer's strong connection to Africa: he helped inspire struggles against racial injustice, fought his biggest bout in Kinshasa, and became a close friend of another legend, Nelson Mandela. South Africans won both the men's and women's race at this year's Comrades Marathon on Sunday, as the country's runners dominated the field and David Gatebe completed the gruelling 89.2 kilometres in a record-breaking 5 hours, 18 minutes and 19 seconds. The 2016 Quidditch World Cup is taking place in July in Germany. Uganda is the only country in Africa sending players to the tournament and money is being raised through a crowdfunding initiative to get them there. So far, the team is astounded by the support they have received. For twenty years, the Oaks Cricket Club in Ga-Sekororo, Limpopo has given local kids a chance to develop their cricketing talent and use the sport to change their lives. A planned documentary and crowdfunding initiative aims to take the club's story to a wider audience. It was a proud weekend in South African sports with sprinter Caster Semenya winning three titles in a matter of four hours. Other South African athletes, such as Wayde van Niekerk, Alyssa Conley, Stephen Mokoka, and Ruswahl Samaai, also scooped titles. Hlompho Kekana's goal against Cameroon in the Afcon match over the weekend has put him in the running for the FIFA Puskas Award for goal of the year. Kekana shot from 70 yards out, slipping the ball neatly past goalkeeper Guy N'dy Assembe, to hit the back of the net.